As the weekend rolls in, many of you are looking for a nice bottle of wine to unwind with. There are many options of course, and almost every one of them is a good one. If you are looking for something new to try, and are a fan of red wine, then I have a great recommendation to kick off the weekend. It’s no secret that I’m a fan of wines from Chile. They offer great value, have a wide range of options from Sauvignon Blanc to Cabernet Sauvignon to Carmenere and Pinot Noir. Yes, Chile, a very hot and dry place, is producing cool weather Pinot Noir now. And they’re doing it well in many cases. I was able to taste four Pinot Noir wines from Chile recently, and enjoyed them all. Today’s recommendation is not one of those four, but I think it’s a great wine, especially for the price. For under $10, you can get a nice Pinot Noir to sip and savor as you put your feet up and relax this weekend. The Chilensis 2009 Reserva Pinot Noir can be found in most wine stores and grocery stores. It comes in at $9.99 locally, and that puts it within almost everyone’s wine budget. It’s a medium bodied red wine, which makes it a perfect summer wine. The palate has red fruit, from strawberry to dark berries, with a little smoke and earth that Pinot Noir is known for. The Chilensis Pinot Noir will go perfectly with most any food you want to pair it with, whether that’s cedar plank salmon on the grill, burgers, dogs, or salads for summer. However, this wine has become a staple at our house, and we just love to sip on it slowly and enjoy. 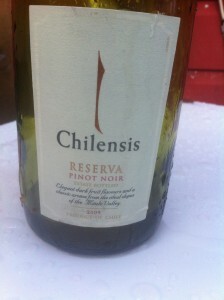 If you try the Chilensis Reserva Pinot Noir, let me know your thoughts. 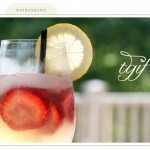 Cheers to a great weekend!